Madison Gallery presents Donald Martiny’s third solo exhibition, SINGULARFORMS. The title refers to the singular form defined by the physicality and the intimacy between the work and artist. Martiny creates a gap between painting and sculpture and rejects the two-dimensional canvas or panel to establish a relationship between space and viewer. These paintings are not layered but mixed into one form; they are dynamic, complex and very personal. “I want my paintings to possess their own life force, their own “breath of life.” I want to offer an intimate, engaging, and authentic experience between the viewer and the artwork. 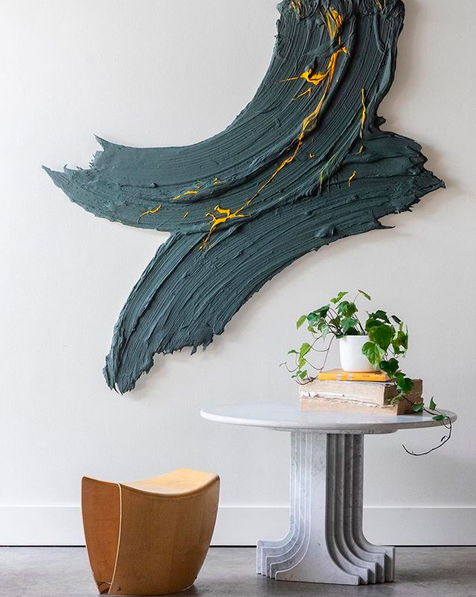 Additionally, I work hard to create work that has a dialogue with the history of painting but at the same time is not beholden to it.” - Donald Martiny. Martiny’s work concentrates on the importance of the brushstroke as a real means of connection between artist and material. 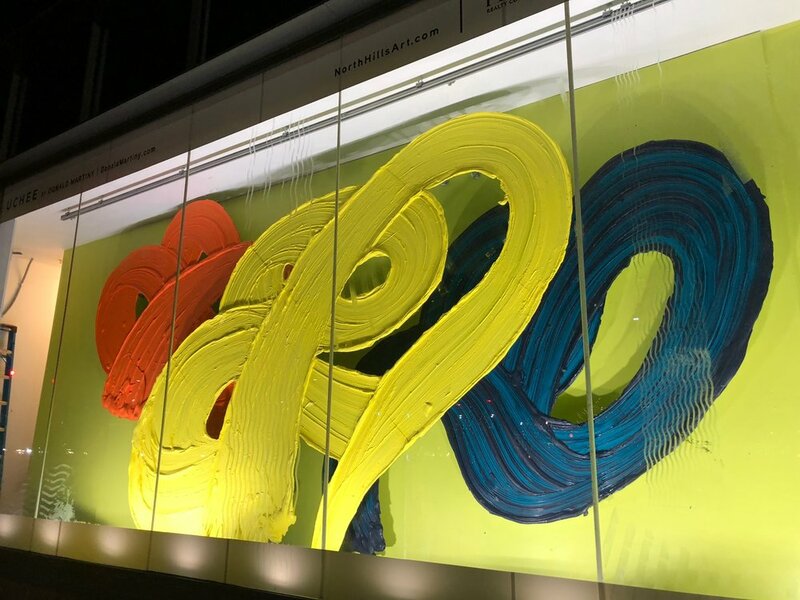 The artist employs pigments, polymer and gallons of paint, sometimes between 30-40 at a time, to create the right color and viscosity to produce each individual composition. 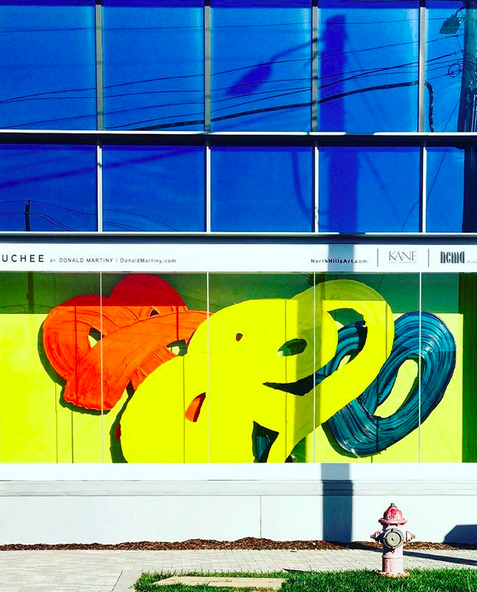 He never thinks of, or use color in a political or symbolic way, nor does he approaches color in a scientific or theoretical way like say Goethe, Chevreul, Itten, or Albers. He experiences painting as pushing and moving pure sensation and feeling, i.e., joy, tragedy, tenderness, affection, love, passion, energy, ardor. More than an exploration of optics or beauty his use of color is a kind of spiritual quest. Martiny’s work has been exhibited in numerous museums, including the Fort Worth Museum of Art, Courtauld Institute of Art, Alden B Dow Museum of Art, Falmouth Museum, North Carolina Museum of Art and the Cameron Art Museum. In 2015 Martiny received a commission from the Durst Organization to create two monumental paintings that are permanently installed in the lobby of One World Trade Center in New York City. In 2015 Martiny received the Sam & Adele Golden Foundation for the Arts Residency Grant and his work has been featured in the Huffington Post, NPR, Philadelphia Inquirer, VOGUE LIVING | Australia, New American Paintings | South and Woven Tale Press. It's been a long process getting an interview going with Donald Martiny. Not because he's is difficult to contact but because it takes me a while to think of the right questions to ask such a complex artist. I had the pleasure of meeting Martiny at my weekly Whitehot Magazine Art Party that happens every Tuesday night at the Jane Hotel Roof Bar in New York City. Martiny is an intelligent, warm individual who has obviously spent many years studying and perfecting his work. I've spent time with Frank Stella and I hold Martiny in the same regard as a modern master in the making. The following conversation took place aproximately one week before I met him at my party. I was born in upstate New York in the early 50s. My family lived in a small split-level house nestled in the middle of an orchard near Ballston Lake. When did you discover art? The first art that I remember being aware of was the Midnight Ride of Paul Revere by Grant Wood which was printed in a repeat pattern on the upholstery of our living room couch. That fantastic imagery was mesmerizing to me and as spellbinding and entertaining as any storybook or film. By the time I was in my early teens we had moved to Holland, Michigan and I was devouring every art book I could get my hands on. At fourteen I began making day trips on my own to the Art Institute of Chicago via Greyhound bus, something no parent would tolerate today. Yes, several. I studied art history at a liberal arts college in Michigan, then moved to New York City to attend the Art Students League where I studied painting with Ronald Sherr and Terence Coyle. Later I went to the Pennsylvania Academy of Fine Art (PAFA) in Philadelphia. At that time I resolutely pursued a classic academic approach to my studies focusing on the figure and landscape. I felt strongly that I needed to learn how to draw and paint before I could allow myself to push on and find my own voice. In the mid-70s I moved to NYC straight out of college to become a studio assistant but sadly that opportunity fell through leaving me stranded but determined to stay in New York. I quickly landed a job managing the art book department at Doubleday on Fifth Avenue and 57th Street placing me just around the corner from many of the important art galleries, such as Betty Parsons, Marlborough, André Emmerich, to name just a few. Many notable artists visited the bookstore and one day Ellsworth Kelly came in to look for a particular book on Turner. Remarkably generous with his time, we spent the entire afternoon talking about shaped canvases, space, color, and Brâncuși. There were many of these kind of experiences that felt inspiring and were critical to my art education. Your work is dramatic and sculptural, how did you arrive at this idea? A turning point occurred one day in the studio a little over a decade ago while I was starting a new painting—a de Kooning kind of gestural study. I had painted a single brushstroke in the middle of the canvas when I stepped back to decide what my next move should be. It suddenly struck me that any other brushwork would only diminish the power and integrity of that original gesture. It felt to me that any additional marks that I might make would only be in reaction to the edge of the canvas or simply filling in the negative areas. I imagined the substrate falling away from a self-contained gesture and immediately began to explore how to let the brushstrokes determine the form of the painting. Once I embarked upon that journey everything changed. Without defined boundaries or limitations to the form, I had to come up with a whole new paradigm of what it meant for me to create a “painting.” This pushed me in every conceivable way to develop paint and support systems that would help me realize this idea. What historical artists inspire you? There are many but I am particularly attracted to the innovators. For example I am in awe of the painterly approach developed by Giorgione and Titian. They were exceptional in their application of loose brushwork, subtlety of tone and pure sensual expression. They pioneered a lyrical way of seeing things unique to the Venetian school that was without precedent. No one had seen paint like that before. Also I recently discovered the work of the Polish constructivist sculptor Katarzyna Kobro. I find her sculptures absolutely remarkable in the way she uniquely organizes space Her work titled, Space Composition 4 (1929) is so brilliant and deceivingly complex that I can hardly stop thinking about it. If you could be one historical figure who would you be? I love to imagine what it must have been like for the first person to draw an image. How magical and powerful that must have been. I recently saw Antony Gormley’s film, How Art Began and found it to be stunningly inspiring and fascinating. The tenderness, attention and perhaps even love that is evident in some of those early cave paintings is breathtaking. It is interesting to think of creating an image when no image existed before. How does that happen? I read voraciously. In the evening I like to read novels and every morning my wife, who is also an artist, and I share a study time. Together we read about art history, theory, criticism, and philosophy. Currently we are reading texts by Yve-Alain Bois, Isabelle Graw, and Rosalind Krauss. What does color mean to you and how to you arrive at specific colors? I never think of, or use color in a political or symbolic way, nor do I approach color in a scientific or theoretical way like say Goethe, Chevreul, Itten, or Albers. In fact I don’t really think of paint as paint, or color as color. I experience painting as pushing and moving pure sensation and feeling, e.g., sympathy, elation, agitation, ecstasy, sorrow, passion. More than an exploration of optics or beauty my use of color is a kind of spiritual quest. What is your work made from, or rather how is it constructed? My process begins with sketching and play. I make sketches everyday, usually first thing in the morning, although sometimes I change things up and sketch in the evening or even late at night for different light and mood. I have a dedicated wall in my studio that I fill with my favorites and live with them for awhile. If a sketch still excites me after a period of time I may attempt to make a larger work using it as a starting point or an inspiration. The goal is not to replicate or simply blow up the sketch but to capture the spirit and feeling of it. The floor of my studio is covered with aluminum, I think of it as an arena. I paint on the floor using my hands or brushes I make from brooms. I am not one to paint from the wrist or from the elbow, I am literally in the paint. And I usually paint directly without drawing. The paint I use is a mix of pigment with a long-chain polymer. Often I grind my pigment using an Ultrasound machine that allows me to maximize the amount of pigment I can load into my mixture. I spend an absurd amount of time mixing colors. Once the color feels right, I may use any number of modifiers to adjust the viscosity, rheology, stiffness, open time, transparency, etc. My large works require gallons and gallons of paint. Once the paint is dry I cut away the negative areas of aluminum leaving only the paint. My process is constantly evolving as I am always pushing my materials, processes, and ideas. What would you like the viewers experience to be seeing a show of your work? I believe you are asking about intentionality. I want my paintings to possess their own life force, their own “breath of life.” I want to offer an intimate, engaging, and authentic experience between the viewer and the artwork. Additionally, I work hard to create work that has a dialogue with the history of painting but at the same time is not beholden to it. Read the interview on the Whitehot Magazine website by clicking here. Ami, 2019 (polymer and dispersed pigment on aluminum), 42 x 67 in. For Donald Martiny, gesture is a constant point of exploration, with each piece relating to gesture in different ways. Some are composed of a single act, while others are built of a cluster of tight strokes. A devoted attention to mark making, intense color, movement and scale are at the forefront of his work. The work in this exhibition brings viewers to a point beyond passive observation. Instead, Martiny invites us to become immersed within them, to actively experience and feel each piece. His works posses a great deal of activity, a humanity that Donald is in tune with. “I want to put the human experience into it. In a sense they are self portraits, a direct reflection of my physicality at a specific time.” Created on the floor as Donald moves around them, employing brooms and at times his own hands as brushes, he is able to push and pull the material, using the whole of his body at the moment of their creation. By leaving the support of the canvas behind, Martiny’s paintings are speaking about “the act” of painting. This isolation of the brushstroke shifts the spotlight to make their movement front and center. By coming off the surface it also removes the art historical reference of paintings as a window, or a doorway, and rather finds them in direct conversation with the architecture of the space, the person looking at them, and the resulting intimate relationships formed inside the space in which they are located. Donald’s work raises an awareness of what is it to be a painting, and the value of one against the whole. They also challenge us to consider how one interacts with their surroundings, and what it means to “move”. 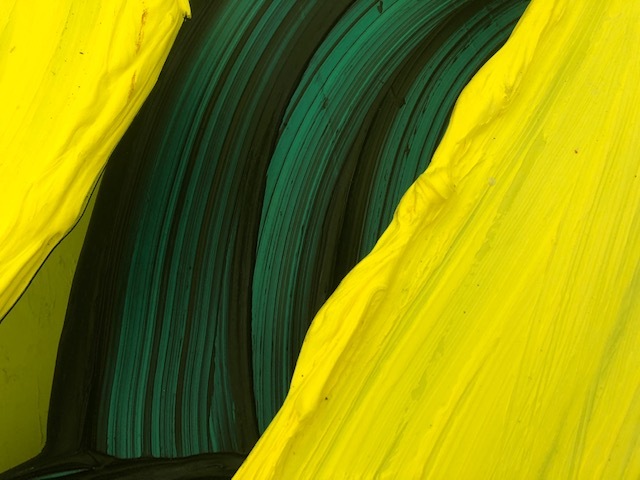 Donald Martiny studied at the School of the Visual Arts, The Art Students League in New York, New York University and the Pennsylvania Academy of the Fine Arts. His work has been exhibited throughout the United States and internationally at museums and institutions: North Carolina Museum of Art, Raleigh, NC; College of Fine Arts and Design, University of Sharja, UAE; Falmouth Art Museum, Cornwall, UK; Alden B. Dow Museum, Midland, MI; GreenHill Center for the Arts, Greensboro, NC; East Wing Biennial, The Courtauld Institute of Art, London, UK; Contemporary Art Museum Raleigh, Raleigh, NC; Cameron Art Museum, Wilmington, NC; Fort Wayne Museum of Art, Fort Wayne, IN; University of North Carolina, Chapel Hill, NC; International Biennial of Non-Objective Art, Pont de Claix, France. In 2015 Martiny received a commission from the Durst Organization to create two monumental paintings that are permanently installed in the lobby of One World Trade Center in New York City. That same year he also received the Sam & Adele Golden Foundation for the Arts Residency Grant. For exhibition dates and opening night reception, click here for information. Read the entire article in Italian by clicking here. The fair took place from February 1 -4 2019. Click here for more information on the fair. Adra, 2018 (polymer and pigment on aluminum) 96 × 48 in; 243.8 × 121.9 cm on view at Palm Beach Modern and Contemporary with Sponder Gallery. Click here for more info on the fair. Polymer and pigment on aluminum; 62 × 31 in; 157.5 × 78.7 cm. Available from Sponder Gallery. The ArtBox is a unique public art display to showcase a rotation of original works by regional artists in an urban setting. The Art Box at North Hills is a collaboration between North Hills and the NCMA. The collaboration features regional and NC art and share information about NCMA exhibitions and program opportunities with the community. The Art Box is open on the ground level of the Bank of America Tower, at the corner of Six Forks and Dartmouth Roads.